The Grand Junction Fire Department responded to the area of the Riverfront Trail and Blue Heron Rd. (behind Bananas Fun Park) for reports of a growing brush fire. GJFD Brush units and firefighting personnel were able to make direct access off the Riverfront Trail and quickly knock the fire down before it spread. 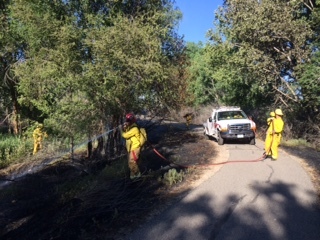 This area of the trail is dense with fuel-filled vegetation and fire crews were able to put a hard stop on the fire and complete a full extinguishment. Approximately 1/2 acre was burn and there were no injuries to any civilians or firefighting personnel on this incident. The cause of the fire is unknown at this time and is currently under investigation.